My Aunt Beth is a quilter now, but years ago she made pins and other jewelry. One Christmas she made me a little green Christmas tree, and my mother a matching red one. 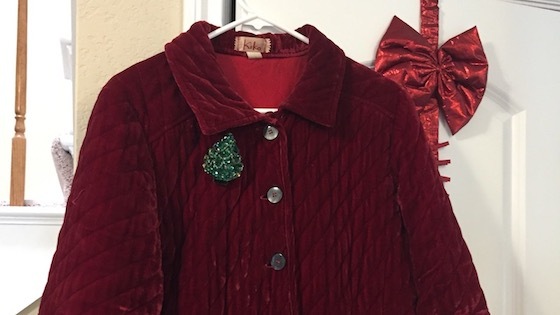 I still wear the Christmas tree pin in December, with my red velvet jacket. I've had plenty of opportunities this year. It has been a busy, Christmas-y season with concerts, parties, and plays. Our church play this year was a re-telling of the Christmas Truce of 1914, during World War I. Kevin Puts' opera called "Silent Night" set the truce in the Belgian trenches, with the cease-fire between German and French/Scottish battalions. Back in the fall of 2006 I started to play the violin again after many years off. One of the first pieces I "performed" after re-starting was a violin arrangement of Fantasia on Greensleeves by Ralph Vaughan Williams. I played it for the church offertory at Christmas that December. I also worked on my new violin blog as I was learning that piece, and it's interesting (at least to me) to go back and see what I was thinking back then. For example, November 28, 2006: "Well, Fantasia on Greensleeves is not "just" a little fun Christmas piece. Last night I had a serious pity party of "what have I gotten myself into?" My goal is to be an ensemble player, not a solo performer!" And November 29: ". . . trying to get my violin into better physical shape. I've posted elsewhere how poorly I feel my violin measures up to the sound of the viola I rented, especially on the G string. Even if my vibrato is okay, the sound is still kind of hollow." And then there's December 10: " . . . the dynamic markings for the violin solo need to be taken with a grain of salt. It's mostly marked piano. But if I really play piano, she'll drown me out . . . I have to play what I would have considered a good solid forte the whole way through in order to be heard." . . .her late husband . . . had used "Fantasia on Greensleeves" as background music to part of one of his films . . . she came to associate that piece with him, and she thanked me for bringing that part of him back to her. The video I mention in the blog seems to have been lost in the mists of time, however, and that is probably a blessing. This year, there was none of that agonizing. I was suffering from Schubert withdrawal from my last concert, so I asked my current music director if I could play something. Remembering past performances, I suggested Greensleeves; we needed an offertory to go along with the children's Christmas play, and it was there. One rehearsal, a quick warm-up, and it's showtime. I still fondly think of and miss Patty DeVore, my former church accompanist, who passed away several years ago. She was one of the first people who believed in me as an adult re-starter on the violin and believed I could do it. 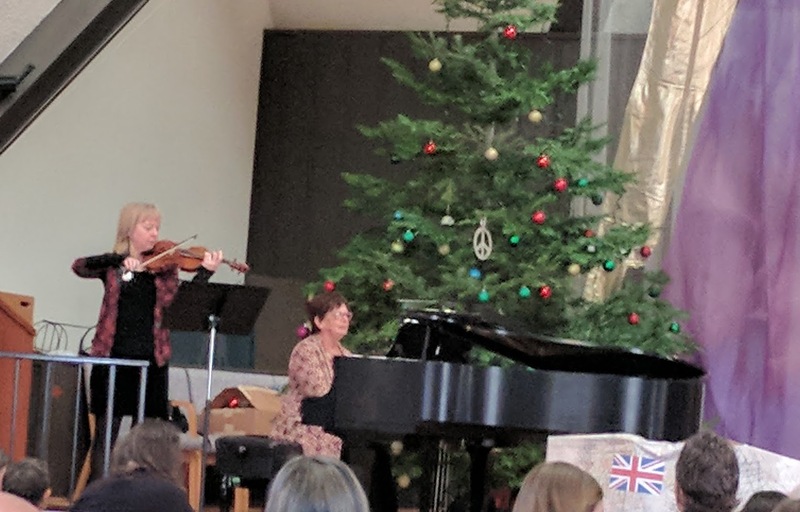 I have a new piano partner now, the wonderful Libby Kardontchik, mother and teacher of many musicians more accomplished than I, but who still makes me feel uniquely supported and appreciated. "What are you wearing?" she asked. "Let's match." "Something dark red. Red sleeves." My hands started out cold again, like they are wont to be. But this time, I had my "wristies" to warm them up. I no longer fret about my violin's tone. I upgraded my instrument several years ago, to one that has such a robust sound that I sometimes have to work harder to play softly, than to play loudly. I didn't have a mic, and I didn't worry about it. Our little pageant was set between British and German forces, perhaps for simplicity. In the tellings, on Christmas Eve, the opposing camps declare a cease-fire, sing Christmas songs together from their home countries, exchange gifts, and even play a game of soccer on Christmas Day. According to Naina Bajekal, writing for Time, "[H]istorians continue to disagree over the specifics: no one knows where it began or how it spread, or if, by some curious festive magic, it broke out simultaneously across the trenches. Nevertheless, some two-thirds of troops — about 100,000 people — are believed to have participated in the legendary truce." I didn't choose Fantasia on Greensleeves specifically to accompany this pageant, but it turned out to be highly appropriate: Vaughan Williams himself served in World War I and arranged a set of carols for his own battalion, which is still performed today. [T]hough the Christmas Truce may have been a one-off in the conflict, the fact that it remains so widely commemorated speaks to the fact that at its heart it symbolizes a very human desire for peace, no matter how fleeting. I'll give Christmas Day 1914 a brief thought, as I do every year. And I'll think about all my friends who never made it home. But it's too sad to think too much about it. Far too sad. December 18, 2017 at 05:40 AM · A reflective blog. I'm going through an action-packed week too. December 18, 2017 at 07:02 PM · Great to hear. December 18, 2017 at 07:18 PM · I love these reflections. So nice to be able to revisit a piece and feel so much more confident. December 18, 2017 at 07:46 PM · Yes! I really noticed that this time around. We didn't have much rehearsal time and didn't need it. We also had to make a small cut for reasons of time and that was easy to do as well. The holidays are a good time to reflect and take stock of how things are going. I'm feeling good about it! December 19, 2017 at 01:59 PM · A wonderful, reflective blog on the commemoration of a truly unusual event which emphasizes all that we have in common, even in time of war. It is also inspiring when we can look back and see how far we have come in our personal quest for mastery of our instruments and the music. Bravo!